On Saturday 31st January we had our first workday of 2015. A good crowd of volunteers braved the cold weather and slippery muddy conditions to help with the activities. We successfully removed the old bent metal "No Golf" sign, which owing to the location, was a potential danger to cyclists and walkers. This took longer than anticipated as it was really dug into the ground. The team also removed an old metal post near the top of the twitten between Woodland Drive and Woodland Avenue. Removing both these signs has made the area look neater and less cluttered. 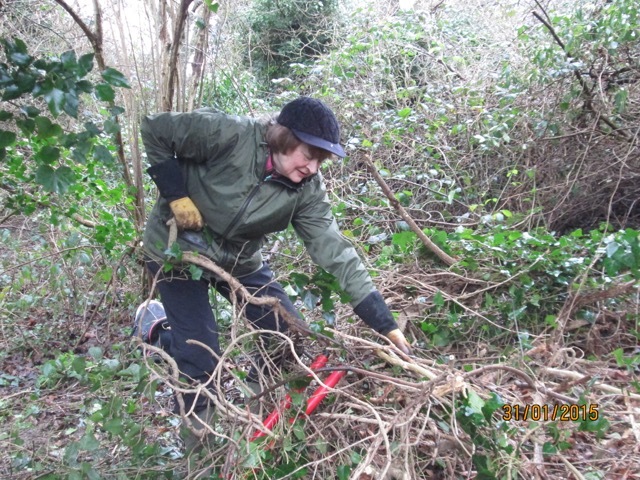 Other volunteers helped remove bamboo and grasses which are not common to the Woodland in the Copse, and had spread from gardens backing onto the Copse. 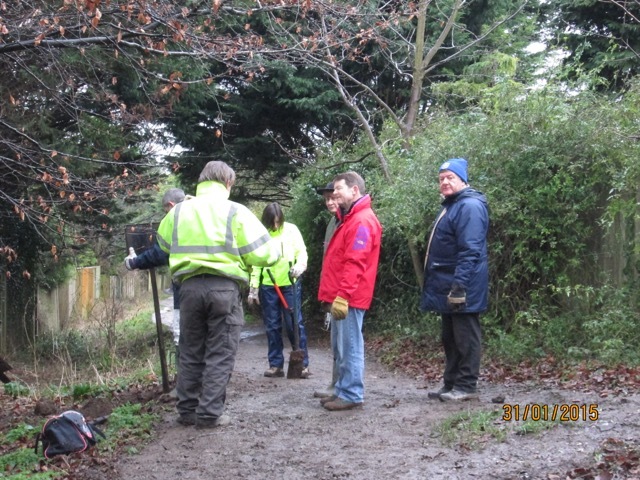 There were also other volunteers working on clearing the paths which had become quite overgrown. Some of the shrubs and saplings had collapsed under the weight of wet ivy and were hanging very low over the paths. Plus our usual "litter picking" duties, including clearing some dumped NSPCC donation bags. !! Thank you to all who attended and worked so hard. It is great to see so many familiar faces and welcome new ones. We always have an enjoyable laugh whilst going about our duties. The Friends Group will meet up again on Saturday 14th March 2015. The work day starts at 10.00am until 1.00pm, always gathering at the bench at the bottom of the green slope, just in front of the grove of Silver Birches.